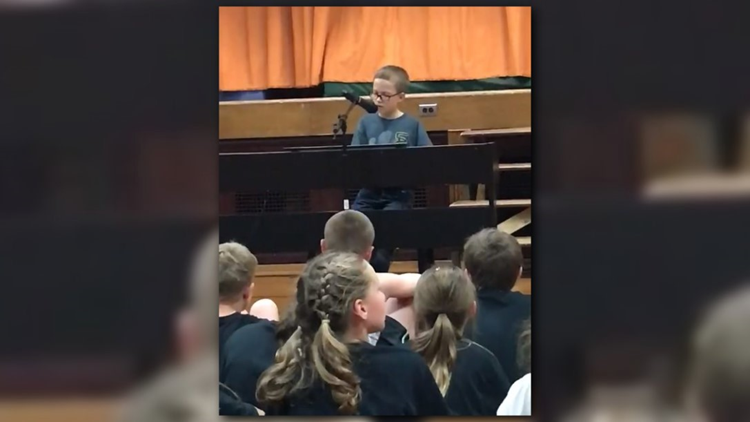 Adam Kornowski, a fourth-grader at Lakeside Elementary in Chisago City, Minnesota performed John Lennon's "Imagine" at the school talent show last week and nailed it! CHISAGO CITY, Minn. - A heartwarming piano performance from a Minnesota student is going viral. Adam Kornowski, a fourth-grader at Lakeside Elementary in Chisago City, performed John Lennon's "Imagine" at the school talent show last week. His mom, Michelle, uploaded it to Facebook. As of Friday afternoon, the video has for than 3.5 million views, more than 95,000 shares, and more than 52,000 reactions. "There wasn’t a parent in the room with a dry eye by the end. He got a standing ovation and the applause lasted forever!" Michelle wrote in the post. Michelle has since uploaded several more performances by Adam and it's quite clear this young man has an amazing talent.